This is an idea I had back in September and I asked Locke to make a script out of it. He did, but for some reason I didn’t get around to making it until now. This entry was posted on Monday, July 5th, 2010 at 12:00 am and is filed under Comics. You can follow any responses to this entry through the RSS 2.0 feed. Both comments and pings are currently closed. 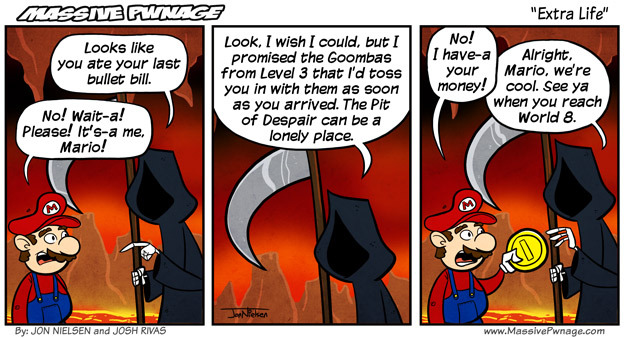 Lazy Bribeable Death, always cheating goomba’s out of their afterlife fun. your banner ad on the right covers the third panel. you may go to hell, do not pass go, do not collect 200 dollars. What browser are you using? I’ve tested the site in just about every browser and the only ones it seems to have a problem in are older versions of Internet Explorer. Hopefully you’re in the minority of people that are seeing this problem, because I have absolutely no idea how to fix it. Only 1 coin? He always charges me at least a hundred. KH question, who was Xemnas talking to in the second Cutscreen on 358/2 days? He mouths his name, but i watched it over and over..im still thinking he says Riku? Don’t think so. Riku’s activities were unknown by the organization outside of Castle Oblivion until his appearance in KHII. One of the mysteries that float around the KH universe is the origin of Xemnas before he arrived at Radiant Garden. Most of the answers are found within Birth By Sleep, but many parts of preKH lore is still unspoken of. You do realize Ansem is Xemnas although? Like Roxas, his name isnt ROXAS…its actually Ven. And since Riku IS Ansem, it confused me. Everyone gets a new name when they enter the organization. Its all very confusing, but in a cut-screen in KH2, you see Riku become Ansem when he takes off that eye-band of his. First I’ll say, if you’re trolling, troll harder. Ansem is not Xemnas. Ansem the Wise, or DiZ as he appears in KH: Chain of Memories and KH2, is not the villain you refer to as “Ansem”. The villain you refer to is Xehanort, the heartless of the person who overthrew the REAL ansem. When he accepted darkness into his heart, his nobody and his heartless formed. His nobody is Xemnas, his heartless, as I said before is Xehanort. Riku, having accepted Xehanort’s darkness as he was his vessel in the first game, is constantly battling the darkness within. He is NOT Xehanort, but takes on his appearance when allowing his dark powers to actually take hold. Think of it as a cursed super saiyan mode. Roxas is not Ven, they aren’t the same character. Roxas is Sora’s nobody. I’m suspecting you didn’t play KH2, otherwise this would have been known to you. Ven is one of the protagonists of Birth By Sleep which takes place years before Roxas’ creation, when Sora is still very very young. Everyone’s name is jumbled and an X is added. Xemnas = Ansem + X, Roxas = Sora + X. I used the name Xemnas when i talked about him arriving at Radiant Garden because his name is unknown before that point. He had amnesia. TLDR : Ansem and Xemnas are different characters. Riku is not Ansem. Ven and Roxas are different characters. I suggest you replay the games in the order of 1, Chain of Memories, 2, to get a better understanding of the origin of Org 13, and the nobodies. Also reading Ansem Reports help. Those Ansem Reports, especially the ones in 2, explain just about EVERYTHING. So whats the scoop behind Xion? There has been numerous..rumors you could say, but my thought is that Xion never quite existed..But was just a fragment of the memories of Sora/roxas ect. Might as well ask since i got the conversation going. Xion was an artificial shell made by the organization. They kept her close to Roxas so she could absorb some of his memories and be able to wield a keyblade. Ence has got the right idea. Wow, i really forget. Im going back to beat the game on proud mode…i cant get how i forgot. I think it’s safe to say that that was the best display of gamer knowledge ever. shouldnt it be an albino thats talking about The Pit of Despair, or failing that, Christopher Guest, not the grim reaper?